We awake to blue skies over Ben Nevis, yes…..still in Scotland, it’s a big old place. 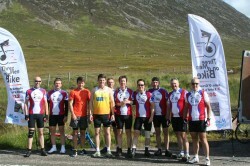 Start time today is 8.30 and some hefty climbs await us, particularly up through Glencoe. Gareth Bevan has enjoyed yesterday so much, he’s staying for more today…is he mad? Overnight James has performed miracles and not only has our friendly receptionist not been sacked, she’s also put £10 on the Three Men on a Bike fund raising page! Thank you Fiona. Lewis says he’ll come and stay on his way back to John O’Groats. I think he was joking, but perhaps if you’re reading this and want him to do it, you can put some money on the Virgin Giving site – he’ll have to do it then!! Excellent Curry last night. Terry and Rose really went for it and thoroughly enjoyed. Must have been a long morning in the van for them today. Jules managed to get the spiciest dish (lots of time in the bushes today) and Simon had his traditional Fahl in a mild Korma sauce, oh and 9 pints of Lager. All in all a good night, but still in bed by 10. After a few miles alongside the beautiful Loch Leven we turned inland to begin our climb up though Glencoe. The first major climb twists and turns up the Glen, quite steep but just long long. After this it opens out into long straight roads that seem to go on forever….climbing. As fatigue starts to set in you soon begin to confuse climbing with descents, are we going up or down? All the downs today, some really long ones, were ruined somewhat by a head wind. You found yourself having to pedal hard downhill! Mind you, I’d rather have the wind than the rain. In the somewhat bleak settings at the top of Glencoe today, rain like day 1…just doesn’t bear thinking about. The long climbs today proved significant for Peter who until now, despite having had a triple fitted to his bike last week, hadn’t used it. The triple gives you three rings on the front and basically a wider choice of lower gears. Great for tough hills. Peter was determined not to use his lower ring and until now was officially a triple virgin. Glencoe proved to be the day he lost this particular cherry and I think he quite enjoyed the experience. Most of us have triples, well obviously not the pro boys Lewis and Neil, and ours are well used! We’ve met many people on our travels so far, cyclists, bikers and walkers. Today we met our match when we shared our provisions with two marathon runners in the middle of nowhere not long after Glencoe. Their challenge was to run the three peaks (Ben Nevis, Scafell Pike, Snowdon) the equivalent of 16 marathons in 16 days. 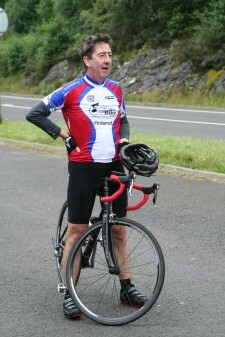 Griffiths said he felt a fraud, suddenly John O’Groats to Lands End didn’t seem that big a deal. Big respect to those guys anyway, I hope they raise the money for Macmillan they’re aiming for. After various mentions of the Bladderettes, I have to report that their etiquette is plummeting. The team had to stop today at a remote set of roadworks with traffic lights at each end. Probably at least half a mile long, so long waits for the lights. We all pulled up by the normal red sign that declares, ‘When Red Light Shows, Wait Here’. It certainly did not give this instruction…. Thank you to Gareth for his support for the last couple of days. A great rider and good fun to have around. 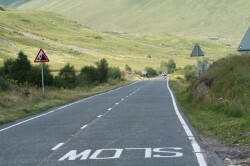 Tomorrow it’s just the seven of us, no guest riders, just a further slog through Scotland, Dumfries here we come. Print article This entry was posted by admin on August 20, 2012 at 8:57 am, and is filed under Uncategorized. Follow any responses to this post through RSS 2.0. You can leave a response or trackback from your own site.